Ryan Hubler finished 3-for-3 at the plate and paced three batters with multiple hits as Canandaigua (2-2) grabbed a 2-0 lead in the third and never trailed. Connor Fisher and Joe Brinza both went 2-for-4, combining for two RBI and three runs scored. Seth Vigneri, Dylan Mackenzie, Michael Sculli and Tristan Tyndall each contributed a hit. Copper Crunick backed up his offense with four innings of one-run ball, giving up three hits and three walks while striking out three batters on 66 pitches. Amaury Samalot finished 1-for-2 with a walk and a run scored for Churchville-Chili. Joe Puglia had a hit and an RBI for the Saints. Jose Morales broke a scoreless tie in the top of the sixth with a two-run single scoring Nick Serce and Jackson DeJohn. Chris Butler struck out 10 and hurled a complete game 3-hitter with 10 strike outs for Irondequoit (3-1). Johnny Fernandes added two hits for the Eagles. Raymond Specht had two hits for Rush-Henrietta (1-1). Griffin Knight had a two-run single and Jack Willard an RBI base hit as Schroeder (3-0) broke open a 1-1 game in the bottom of the sixth with five runs on three hits, three walks and a hit by pitch. Junior Peter Smith struck out four and allowed two hits and one walk over six and a third for the win. 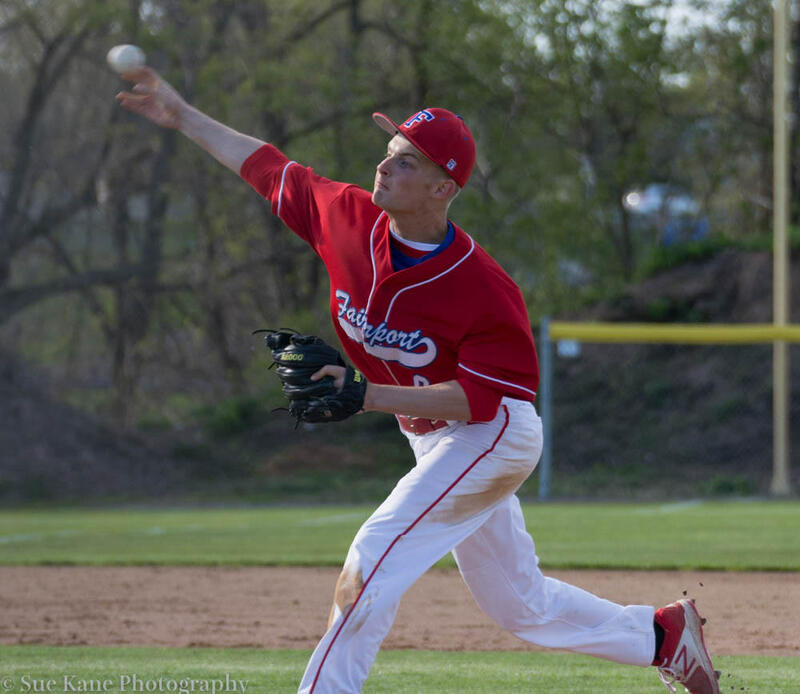 Penfield’s Andrew Ebersol fanned 11 over six innings of work. The Patriots fell to 4-2. Junior Caden Hahn fanned six and allowed one hit over four innings for his first varsity win. Justin LaLoggia set down four on strikes over two innings, and Derek Ogi struck out two over an inning of work. Jim Marasco paced the Thomas (2-1) offense with two hits and two RBI. Matt Stuewe and Ethan Maltman added RBI singles. Ryan Hill finished with a hit, two walks and two stolen bases for the Titans. Drew Delaney hurled a complete game 3-hitter and improved to 2-0 on the season. The junior right-hander struck out three for Victor (3-2). Chris Varone finished 1-for-3 including a two-out, two-run double in the third to give Victor a 2-0 advantage. Varone finished with three RBI on the day when he brought home Ryan Lukas with a ground out in the fifth for a 4-0 Blue Devils lead in the fifth. Tommy Ryan went 1-for-3 with a double and a run scored. Nate Hampson was 1-for-3 with an RBI. Jason Nau started and threw five innings for Spencerport (0-6) The senior went 2-for-2 at the plate. Greg Ranieri singled home the lone Ranger run. George Gines scattered two hits over five innings for Mendon (3-2). The senior right-hander struck out six, walked three and needed just 64 pitches. At the plate, Gines had a hit and scored twice. Billy Dalton led the offense with two hits and a walk. Jake Ring and Cam Yonda had a hit and drove in two runs apiece. Ring also scored a run. Jared Petrichick singled and scored a run. Owen VanNewkirk had a double for HF-L.
Devin Marshall finished 2-for-3 including a two-out, two-run single in the third to break open a tie game. Fairport (3-4) went on to score two runs in the fourth and three in the fifth. Mike Sabatine and Jake Schuler both doubled and had three hits apiece. Schuler drove in four runs. Sabatine scored three times. Tyler Holmes went 2-for-4. Tyler Smith had a hit, a walk, drove in a run and scored twice. Omar Rosa was 1-for-3 with an RBI and a run scored. Schuler allowed three runs (one earned) on one hit over five innings. He struck out six and and walked five. Anthony Roides struck out two and hurled a scoreless inning in relief. Isaac Yorkey had a double and an RBI for Arcadia (0-2). Ben Bell, Sam Carducci, Drew Southcott and Nate Yantz scored a run apiece for the Titans. Frank Lauricella allowed an unearned run on two hits over five innings, and Brockport (4-3) won its fourth straight game. The senior southpaw struck out two and walked three for the win. He also drove in two runs with two hits. Cole Penders finished 2-for-3 with two doubles, an RBI and a run scored. Gordon Fisher went 2-for-4 with a run scored. Joshua Keenan, Samuel Velletri, Ashton Scott and Dominic Passafiume had a hit and a run apiece. Joshua Battaglia went 1-for-2 with a double, a walk an RBI and a run scored for Hilton (2-3). Trojans improve to 2-1. James Sciortino hurled a complete game, 2-hitter on 73 pitches for Athena (2-1). Mike Ruta plated a run with a triple, and Tyler Curtis collected two hits and a run scored for the Trojans. Odyssey’s Korey Canton held Athena to four hits. Davis Heyman, Jack Bergin, Dylan Armanini, Keeghan Cummings, Jackson Renica, and Layton Cummings each had two hits, combining to go 12-for-14 at the plate with eleven RBI and twelve runs scored to lead Sutherland (3-3). Will Ling, Quinn Wilcox, and Connor Fitzsimmons had a hit apiece for the Knights. Graham Schild started and allowed one hit over three shutout innings. The senior right-hander fanned six using 46 pitches. Tyler DePaolis hurled two shutout innings in relief. Ben Beauchamp collected five RBI including a grand slam in a 12-run second as McQuaid (6-1) breezed to its first victory over a Section V opponent. Hunter Walsh allowed three runs (one earned) on three hits over three innings for the win. Noah Campanelli finished 2-for-3 with a double, three RBI and two runs scored. Ryan O’Mara, Drew Bailey and Mike Carins each had two hits. AJ Fina and Tyler Griggs scored three runs apiece. Ben Hintz struck out two over two shutout innings in relief. McQuaid opened its season going 5-1 at Dodgertown in Vero Beach, Florida. There were no black cats anywhere in sight, no ladders to walk under, and there was no grains of salt to be found at Cuba-Rushford. When Miles and longtime friend and C-R coach Steve Yatzkanic met for the second and final time this season, it would be one for the record books. READ MORE. The Falcons won their season opener after having their first three games postponed. Spencer John led the offense with three hits, an RBI, and two runs scored. Nicholas Twardeski went 2-for-3 with two RBI and three runs scored. Nassir Whitley, Cole Acker, John Zajac, and Cameron Cupp each had a hit and combined to go 4-for-13 with two RBI and four runs scored. Whitley also dazzled on the mound with four scoreless innings, giving up two hits, a walk, and striking out five batters on fifty-three pitches. Alex Savory fanned 14 and tossed a 2-hitter for Sodus. The senior also finished with a double and two RBI at the plate. Ryan DeBadts was 2-for-2 with a stolen base and two runs scored. Waterloo’s Ken Mattoon struck out eight and allowed two runs over three innings. Ethan Hunt was 1-for-2 with an RBI. The Bulldogs improved to 2-4 with the shutout win. They scored two runs each in the first and fifth innings while adding runs in the third and sixth.